William Strickland’s design for the United States Mint in Philadelphia in 1833. It has since been demolished. Courtesy of the Free Library of Philadelphia, Print and Picture Collection. 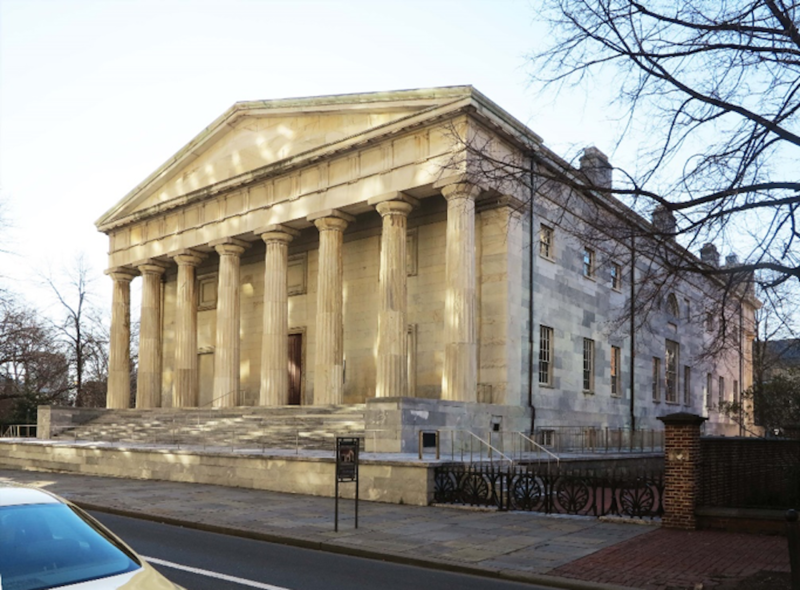 William Strickland’s first Greek Revival building was the 1818 Second Bank of the U.S., in Philadelphia, which established the connection between money and classical styles in the US. Courtesy of Robert Russell. 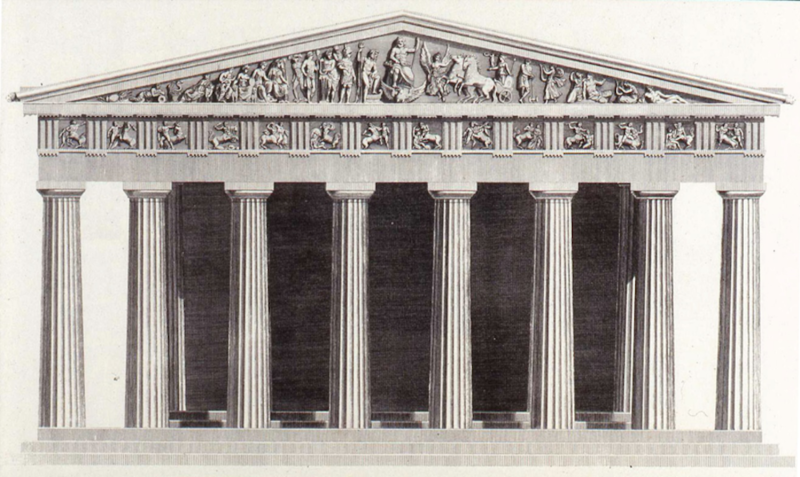 The American Greek Revival style was inspired by illustrations in Antiquities of Athens, like this one of the front of the Parthenon, Athens, 5th century B.C. Stuart & Revett, Antiquities of Athens, v.I, 1762. Anonymous farmhouse in Hope Valley, R.I. contains classical elements. It was probably built in the 1830s. Courtesy of Robert Russell. William Strickland’s last building was the Tennessee State Capitol, in Nashville, built 1845-59. Courtesy of Robert Russell. The Montgomery County Courthouse, in Dayton, Ohio, was built in 1847. Courtesy of Robert Russell. 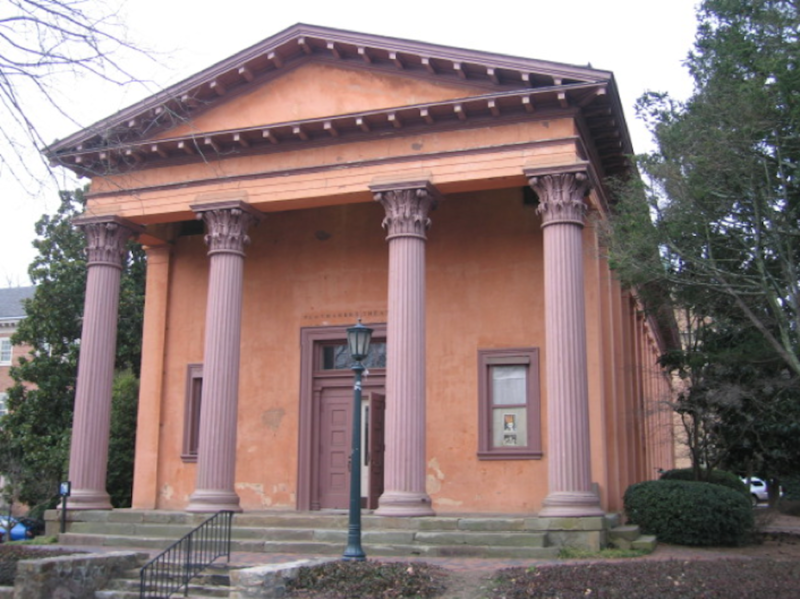 Strickland’s design for the Mechanic’s Bank, built in Philadelphia in 1837. Courtesy of Robert Russell. Playmakers Theatre (originally Smith Hall) at the University of North Carolina in Chapel Hill. It was built in 1851. Courtesy of Robert Russell. Gradually, though, he came around to the idea of a grander mint, and became personally involved in many aspects of the building’s design, from its placement in a prime location, backed up to one corner of Centre Square, at the literal center of Philadelphia, to the rich materials used in its construction. Brick became marble, a copper roof was substituted for the original tin. When the cost of building the mint doubled, it was Jackson who assured that Congressional appropriations were adequate to execute the design. Jackson’s embrace of the grand architectural style known as Greek Revival wasn’t as strange as it may seem. In an emerging American Republic whose early citizens had to define the national character from scratch, the stately building style, borrowed from the ancients, became a perfect mode of expression. 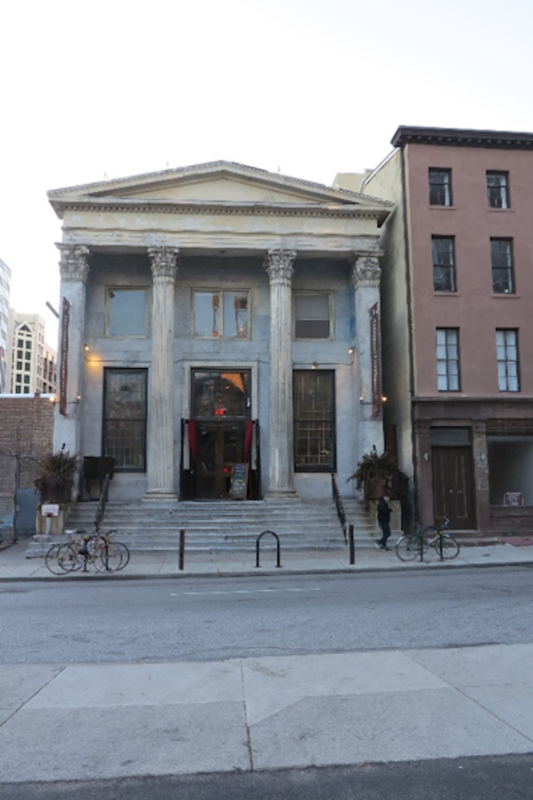 By the 1830s, most public buildings in the U.S. were being designed as Greek temples serving some other function: temples of commerce, temples of law, temples of learning. You can still see the Greek style’s imprint in the North and in the South, in cities and in rural areas, on modest shopfronts and in grand monuments. The Greek Revival style of architecture—imbued with balance, adaptability, and democratic roots—became the first truly national manner of building in our new country, the dominant architectural style from the 1810s until the onset of the Civil War and one that still echoes in our culture today. Its greatest champion was the very man who designed the mint that so captured President Jackson’s imagination: the Philadelphia-based architect William Strickland. Strickland was born around 1788 in the wilds of Monmouth County, New Jersey and raised in Philadelphia, where his father, John Strickland, worked as a carpenter. The elder Strickland, a gregarious fellow, befriended the first professionally trained architect in America, Benjamin Latrobe, in 1798 while he was working on the architect’s first Philadelphia building, the Bank of Pennsylvania. Architecture was an uncertain profession in America’s early days, when all you needed to do to become an “architect” was hang out a sign calling yourself one, but Strickland got something close to a real education in the subject. Latrobe got to know the family and was impressed with young William Strickland’s drafting talent. He took him on as a full-time apprentice in 1801. Latrobe, who had emigrated from Britain in 1796 and ultimately settled in Philadelphia, had been trained in the Neoclassical style, but he soon had to adapt to his new surroundings. Nowadays, the term “Neoclassical” is usually used—even by people who should know better—as a catch-all stylistic shorthand for just about any building with columns. But Neoclassicism was originally a movement that aimed to uncover the origins of the art of architecture. In the Neoclassical imagination, Adam’s hut in Paradise morphed into Greek temples and Roman palaces. Along with this fictional history, Neoclassical architects made great use of elemental geometric forms like cubes and spheres. Elegant and highly intellectual, Neoclassicism was a hit in places like Paris but supremely ill-suited to the earthy temperament of the American continent, which in the early 19th century was preoccupied with the future, not the past. Latrobe never abandoned his love for the Neoclassical manner, but he soon realized it was going to be a non-starter in his new country. Inspired by the 1762 publication of Antiquities of Athens by the Englishmen James Stuart and Nicholas Revett, he switched to the Greek style. Stuart and Revett were architects who spent several years drawing the fragmentary remains of ancient Athenian buildings and making the most detailed depictions of these structures published to date. Latrobe had never been to Greece, but it was no longer necessary to have seen a Greek building to know exactly what one looked like. Antiquities erased any uncertainty about the details. It was a book whose time had come. Latrobe passed his reliance on Antiquities to his apprentices—including William Strickland. Strickland didn’t leave behind any writings about architecture or his design philosophy, but it is clear that he was positively smitten with the Greek manner. (One story, which I have not been able to confirm, holds that in later life he told his own apprentices that all an aspiring architect needed was a copy of Stuart and Revett.) On a personal level, the style may have provided him a means to break free from the Neoclassicism of his master, Latrobe. But Strickland seems to have had another reason for designing Greek buildings that was more public, and more profound: He presented the Greek style as a basis for a truly American style of architecture. His indefatigable devotion to it made him a dominant architect in the United States for almost 20 years. Strickland began to build his reputation with the Second Bank of the United States. He won a competition to design the bank in 1818, and it kept him busy for about six years. The Second Bank was the first modern construction explicitly based on the Parthenon on the Athenian acropolis, with its eight fluted columns supporting a correct Doric entablature and triangular pediment. 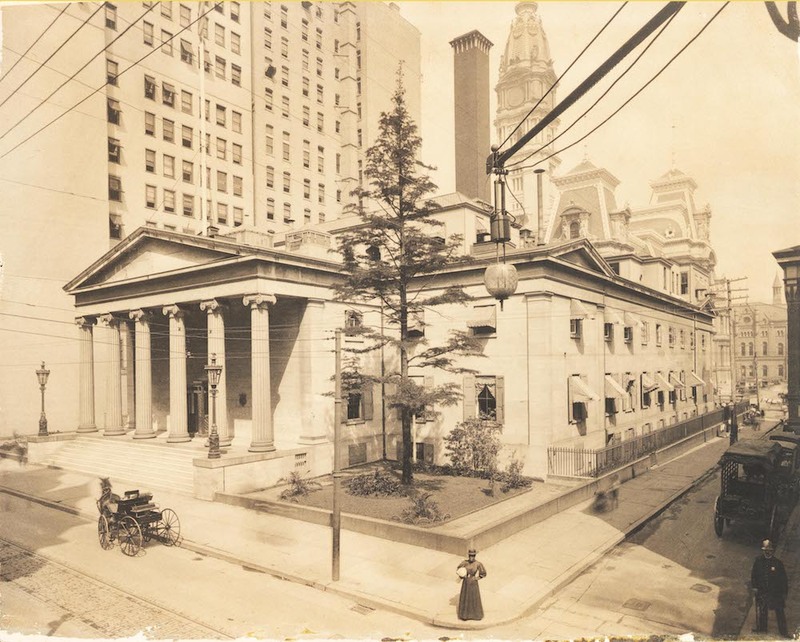 Prominently sited on Chestnut Street, a block or so east of Independence Hall in downtown Philadelphia, this was the building that first established the connection between money and the classical styles in the United States that lasted until the middle of the 20th century. The bank was an instant critical success, not only within Philadelphia, but up and down the entire Eastern seaboard and abroad. It became the first internationally famous American building and a must-see attraction for any sophisticated visitor to Penn’s city. For all its fidelity to Greek roots, Strickland’s Second Bank was a particularly American project. It was, after all, a bank: a no-nonsense temple of Mammon, and one of the key foundations supporting a nation of the people, by the people, and for the people. Cephas Childs, a noted Philadelphia engraver and publisher, knew Strickland, and quoted the architect’s description of the Second Bank while adding his own gloss: “In this new and growing region where so many states are displaying the honorable pride of sovereignty,” he said, “[…]it is natural to look for the simplest style of architecture in that nation, which above all others, has assumed as the basis of its institutions the utmost simplicity in all its forms of government.” The Greek manner fit the bill. Painting of William Strickland by John Neagle, 1829. Courtesy of Yale University Art Gallery. Over the course of his career, Strickland designed over 40 U.S. buildings and monuments that could be described as Greek: custom houses, federal mints, a merchants’ exchange that was the most elegant building in Philadelphia in the early 1830s, an Athenaeum in Providence, Rhode Island, theaters, hotels, and houses large and small. He found the Greek style adaptable to almost any architectural purpose in America. Its simplicity of ornament reflected the sturdiness and authenticity of Americans. Transcending politics, it appeared in the columned homes of Southern planters and the stylish abodes of well-to-do New England Whigs. 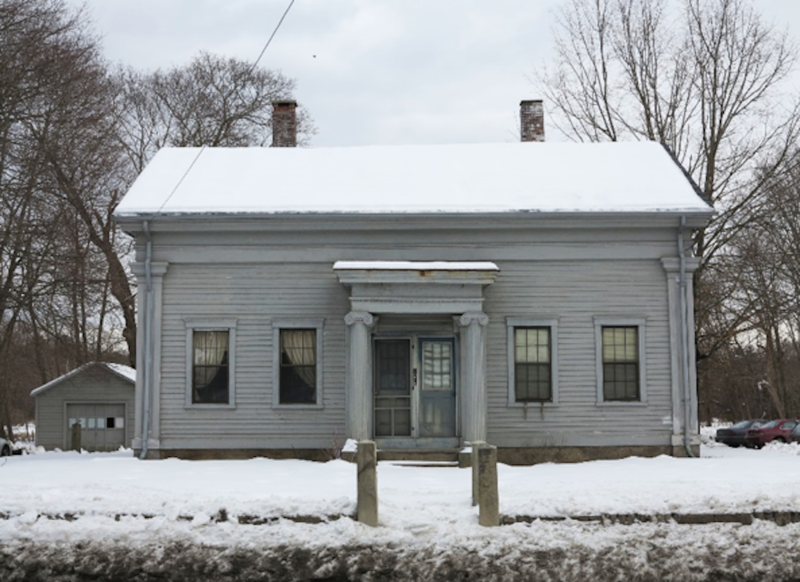 It’s no accident that, in a toned-down form, Greek Revival architecture even followed Western settlers to the frontier, where it was frequently radically simplified in the hands of unskilled builders. “Carpenter Greek” was distinguished by its use of wood rather than stone or brick, and the almost invariable central portico with a pediment supported by square pillars—a demonstration of its ability to express a democratic egalitarianism. 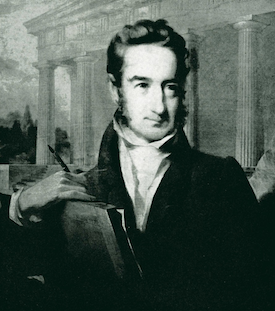 The volume, consistency, and success of Strickland’s work suggests that he understood this connection between the Greek Revival and the development of a national architecture for the young democracy—and that he transferred his zeal to the patrons he met along the way. The federal mint building in Philadelphia, which so piqued President Jackson’s interest, is a perfect example. Samuel Moore, the director of the mint, wrote to the Secretary of the Treasury about Strickland’s proposed new building, talking about “the general character of the Edifice and [its] style of execution,” which, he stressed, were “appropriate to the purpose to which it is devoted and to its national character,” which is “what the Pres[iden]t had in mind.” I believe that these associations must have come directly from Strickland, who was in close contact with Moore throughout the planning of the building. You can still see the Greek style’s imprint in the North and in the South, in cities and in rural areas, on modest shopfronts and in grand monuments. 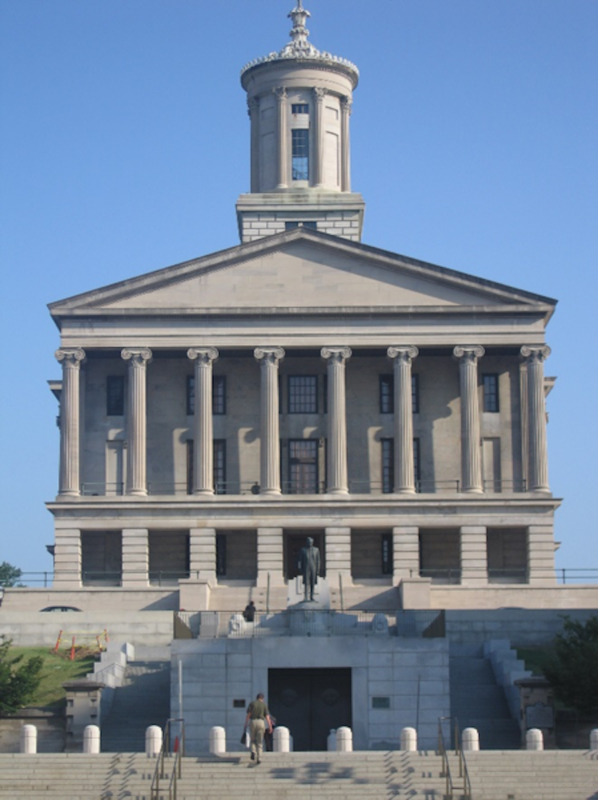 Just as Strickland’s Second Bank of the United States was the first really significant example of Greek Revival design in this country, his Tennessee State Capitol, in Nashville, turned out to be the last great building in the style. 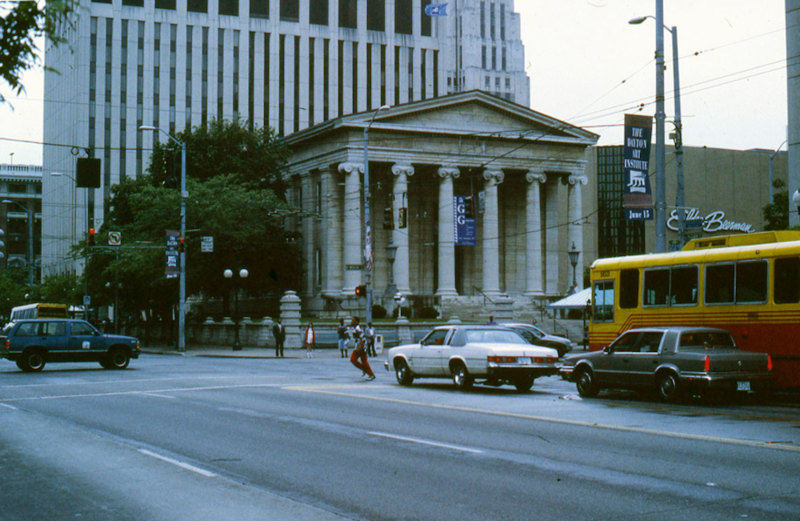 The building, standing atop Campbell’s Hill, in the center of town, is an improbable, but successful, combination of a Greek temple of the Ionic order and a central vertical tower based on the Choragic Monument of Lysicrates, an Athenian structure Strickland reverted to several times in his long career. It was a spectacular culmination of Strickland’s decades-long preoccupation with Greek architecture. Strickland didn’t live to see his Capitol triumph, which had come against all odds—largely because the Tennessee legislature balked at paying for the building. Strickland had been hired to design the building by the state of Tennessee in 1845, soon after Nashville was chosen as the permanent capital, but the building’s construction dragged on until the eve of the Civil War. Strickland apparently understood that the Capitol was going to be his last building; at his request, the building committee persuaded the legislature to pass an act allowing Strickland to be buried in it. In 1854, Strickland died, and was interred in the north porch of the still-unfinished capitol. The Greek Revival was waning, to be replaced by other styles after the Civil War. Some, such as the Gothic and Renaissance Revivals, had been around since the 1830s, and others, like the Baroque Revival—commonly known in this country as the General Grant style because of its flourishing in the 1870s, during Grant’s presidency—became popular after the War. But even as the chaste columns and pediments and rigid symmetry of the Greek manner gave way to a profusion of Victorian ornament, humble, quirky, and homemade examples of the Greek style would still be built almost everywhere across the country, in high-style buildings like banks, and in purely utilitarian structures, like waterworks. In its flexibility, versatility, and charm, the Greek is perhaps as close to a truly American architecture as we will ever have. Robert Russell is a retired architectural historian. He is the author of William Strickland and the Creation of an American Architecture.